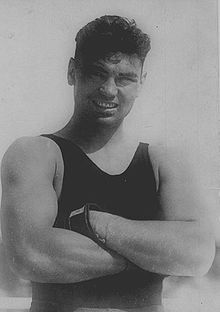 William Harrison "Jack" Dempsey (June 24, 1895 – May 31, 1983) was an American boxer who held the world heavyweight title between 1919 and 1926 Known as "The Manassa Mauler", Dempsey was a tremendous puncher famous for his exciting fights, many of which set financial and attendance records. He won the title by beating Jess Willard on July 4, 1919. He defended the title six times before losing it to Gene Tunney in 1926. They had a rematch in 1927 and Tunney again beat Dempsey. It was during this fight where the "Long Count" took place. Dempsey knocked Tunney down in the seventh round. The referee would not start counting until Dempsey went to a neutral corner, so it is estimated that Tunney had as many as fourteen seconds to rise (instead of the usual ten). Dempsey retired in 1928. He fought exhibitions after his retirement, served as a commander in the Coast Guard during World War II, and opened a restaurant in New York City. This page was last changed on 15 March 2019, at 13:51.